KYBB Knotty Boys Ball Bearings. KYBZ05OD Knotty Boys Buckle. OD Green. KYCP2 Knotty Boys Barrel Buckle. KYCPC Knotty Boys Buckle Coyote. KYCPOD Knotty Boys Buckle OD Green. KYCPP Knotty Boys Buckle Pink. 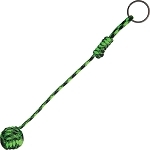 KYL000 Knotty Boys Zombie Lanyard.